Dembele, the signing Barcelona needed? It is fair to say that the mood surrounding Barcelona of late hasn’t been an inspiring one, especially after the departure of Neymar, but in Ousmane Dembele the club has made the signing they so desperately needed. Dembele is not Neymar, at least not at this point in his career, yet his arrival does wonders for the perception of Barcelona at this very moment. Losing one of the best three players in world football is something that you can’t recover from quickly but we can all understand the frustration and concern from supporters. The 20-year-old Frenchman arrives as one of the most promising players in world football, he has stepped up his performances accordingly with every upward move he has made and there is an expectation he will do the same at the Camp Nou. In terms of his position on the pitch, naturally he is Neymar’s replacement but it is the fact that he fits perfectly as the type of forward Los Cules tend to excel with that makes the signing so exciting. Dribbling is his strongest attribute and make no mistake, the former Dortmund forward is a box of tricks with Barcelona always appreciating such talents in their attacking stars. People came from all corners of the globe to catch a glimpse of Ronaldinho in his prime and Dembele can be as creative and as unpredictable as the legendary Brazilian. It will take a lot of hard-work, time and patience for that to be the case but Barcelona have added a mercurial talent to the squad. His story is a fascinating one with it actually former Manchester United defender Mikael Silvestre who first saw exactly what the Vernon born winger could develop into. “I’ve seen Cristiano Ronaldo at the same age when I was at Manchester United and Ousmane certainly has some characteristics of a young Cristiano,” he explained. At the time Silvestre was an advisor to the president of Stade Rennais who, upon the former Inter defender’s recommendation, took steps to secure the teenager to his first professional deal. Rennes’ faith was rewarded as he went onto produce a quite wonderful season in 2015/16 with his performances putting him firmly on Barcelona’s radar. It was determined that he was still a little too raw to come into such a big club in 2016 and of course Neymar’s presence would have made game time very difficult to come by. As such Borussia Dortmund’s interest handed Dembele the opportunity to move abroad and test himself and he duly succeeded again. The 2017 market has shifted and prices for players are now quite simply ridiculous, yet that is the market clubs are forced to work within. 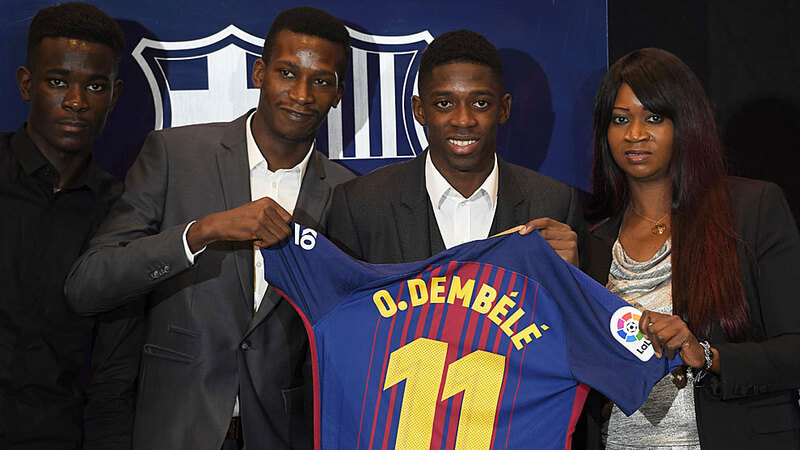 Despite considering Angel Di Maria and Eden Hazard as other options, Dembele was seen as the best option by those in power at the Camp Nou. As was made clear by the 17,000 supporters turning up to the stadium to witness his unveiling, the hype surrounding the French superstar’s arrival in LaLiga is sizeable. He now has to put the work in to develop and improve, but after a difficult summer, the Blaugrana have given their supporters something to feel encouraged by.